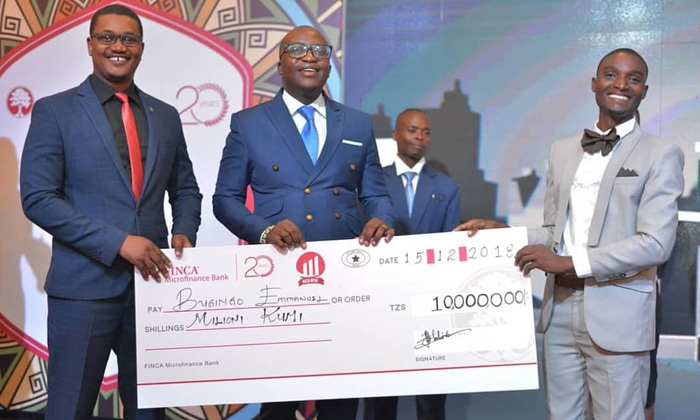 Bugingo Emmanuel has emerged winner of business competition Kuza Ofisi na FINCA and wakled away with 10 million shillings after a three month long competition and over one thousand aspirants 4 finalists presented their business plans to a panel of judges and voted by the public. Speaking during the final episode of Kuza Ofisi na FINCA completion in Dar es salaam, deputy minister for labor…….Hon. Anthony Mavunde applauded FINCA for undertaking an innovative initiative to support growth of small and medium sized entrepreneur. He said that the government continues to put into place conducive environment for development of business and commerce in the country. ‘I call on youth to take up opportunities provided by government empowerment funds put aside for development of businesses. He also applauded FINCA Microfinance bank for initiatives aimed at supporting growth of SMEs in the country ‘I praise FINCA for coming up with this innovative program that not only supports small businesses with capital but also empowers youth with knowledge and business skills’. The three-month program and competition aimed to empower micro-entrepreneurs by providing business skills, knowledge and injection of TZS 10 Million worth of capital to the best business idea presented. The Runner up Sadiki Hassan walked away with 5 million shillings while the second runner up Rueben Waya walked away with 3 million shillings. Kuza Ofisi na FINCA competition was initially implemented in four of Dar es Salaam’s districts that include, Kinondoni, Ilala, Temeke and Ubungo. These districts were attached to the bank’s branches that are strategically located in Tegeta, Ilala, Victoria and along Pugu Road towards the Airport.